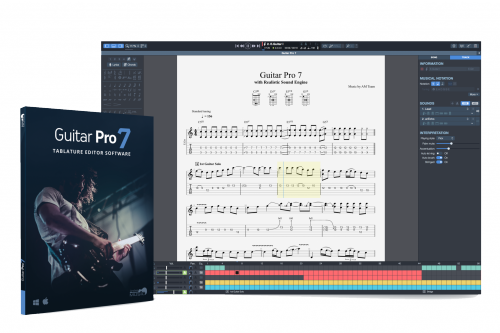 Tablature and score editor: Guitar Pro offers many editing functions: 3 types of notation (standard / tablature / slash), scaling, and a virtual fingerboard / keyboard to visualize the exact position of the fingers on them. Edit your compositions: Create your own professional scores for one or more instruments and quickly record notes using the numeric keypad, mouse, or even a MIDI instrument. Mix your sounds: The sound engine offers over 1000 sounds (presets) using 200 sound banks and 80 effects / amplifiers recorded in the studio. Choose your sounds from the built-in sounds or create your own presets. Improve your technique: Enjoy a series of tools to optimize your sessions: tempo, loop player, metronome, chord and gamma library, guitar fingerboard and piano keyboard. You can also create your own or buy score files, and then be able to play solo or turn off individual parts. Thousands of tablature on the Internet: The Guitar Pro file format is most common when it comes to searching tablature on the Internet. Upload your songs online or get access to 2000 high-quality tablature with a full set of tools made by our team on mySongBook.